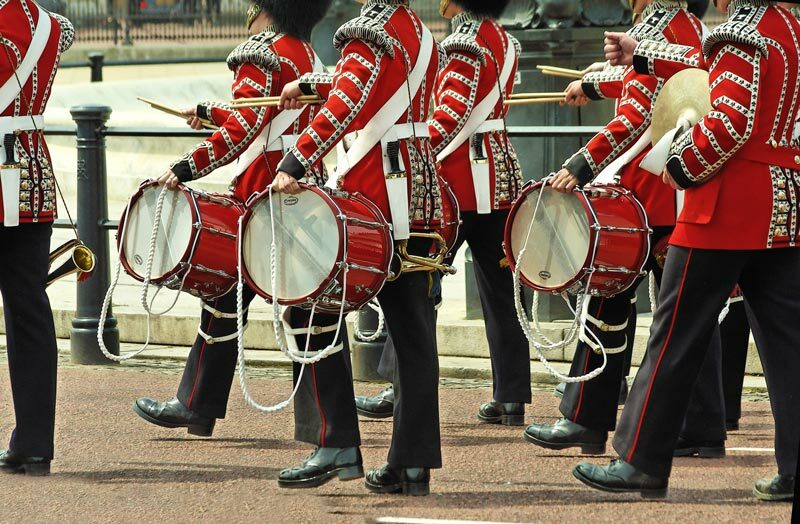 Experience a traditional ceremony full of military pomp and pageantry, with Trooping the Colour on Horse Guards Parade. Marking the Queen’s official birthday, this annual event features hundreds of officers, horses and musicians from the Household Division in ceremonial uniform. The Queen herself attends the ceremony. She is first escorted in a carriage from Buckingham Palace to Horse Guards Parade. There, she carries out an inspection of her troops, before leading her Guards in a parade back down The Mall to Buckingham Palace. Once at the palace, the Queen takes the salute, and guns are fired in Green Park and at the Tower of London. Finally she joins other members of the Royal Family on the Palace balcony to watch the Royal Air Force fly-past. Events begin around 10am and the RAF fly-past takes place at 1pm. After existing in various forms since the 17th century, the Trooping the Colour ceremony has been held every year in London to mark the sovereign’s official birthday since the accession of King George IV in 1820, except during the world wars and a national strike in 1955. Although the sovereign’s official birthday is celebrated in June, Queen Elizabeth II’s actual birthday is on 21 April. Monarchs are traditionally given a second birthday if they were not born in the summer, in case the British weather is unsuitable for an outdoor event! Tickets for the seated stands on Horse Guards Parade are available to the public. The ballot for Trooping the Colour 2017 tickets is now closed. Find out how to apply for tickets to next year’s Trooping the Colour ceremony.